A new animated entry into the “Star Wars” franchise kicks off Sunday, with diversity front and center. Growing up, Christopher Sean didn’t have an abundance of role models that he felt he could relate to. He had his heroes, for sure, and one in particular proved to be inspiring in more ways than one. In his room hung a poster of Bruce Lee, and the young Sean was inspired to pursue martial arts, including jiu-jitsu and taekwondo. It was Lee’s words, however, that have had a farther-reaching impact outside of the gym. “Take what works, discard what doesn’t and make it your own,” Sean said, paraphrasing Lee. Sean has made a new role his own, one that might well make him the hero of a new generation of youngsters. The 32-year-old is voicing the lead character of “Star Wars Resistance,” the newest entry into the biggest franchise in the known universe. 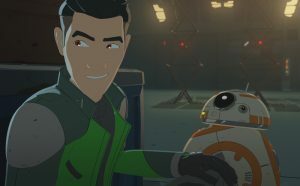 The animated series debuts Sunday on the Disney Channel and across Disney’s various streaming platforms. Viewers of the NBC soap opera “Days of Our Lives” or “Hawaii Five-0” on CBS will surely recognize the handsome and hunky Sean, as he was a regular on both shows for a couple of years. His voice, however, may not be as familiar, and his first gig in animation couldn’t have come on a larger stage. 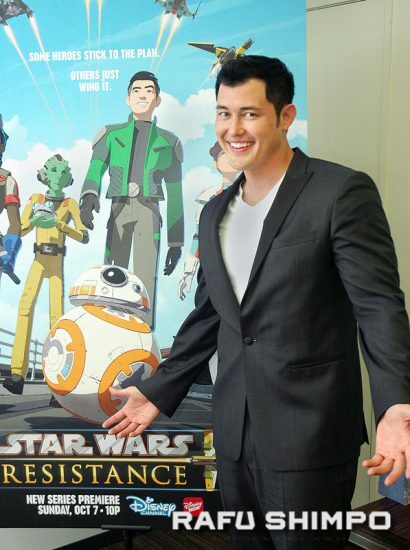 “I got a call that said Lucasfilm wants me to read for the lead of this new show, so I thought that was awesome,” Sean explained, noting recent progress of Asian faces or voices gaining prominence in mainstream entertainment. With this being his first foray into voiceover work, Sean immediately recognized the differences from appearing on-camera. “You can’t hear an eyebrow raised or hear a smirk,” he explained. Sean was born in Oak Harbor, Wash., but was on the move at an early age. His father, Patrick, was in the Navy, meaning the family was often relocated to wherever Dad was stationed. Years earlier, it was during a deployment in Japan that Patrick was lost in a train station and asked a young woman for directions. So smitten was he with the lady named Sayuri, that he returned to the station on several occasions, hoping to reconnect with her. They found each other again, initially communicating through the use of translation dictionaries, and were eventually married. Three children followed, Sean and two sisters. As the family moved between the Philipines, Japan, Mississippi and Southern California, Sean developed fluency in English, Japanese and Spanish, with some ability in Tagalog and Thai. With his father often away from the family on deployments, Sean and his sisters would make video messages to send, a habit that led him to develop a level of ease in front of the camera. As a kid, he knew he was different from his peers – “In Japan, I was always considered ‘Amerika-jin,” but in the U.S., I was always Asian,” he said. Sean’s size and conditioning have been another key to his success. After doing some modeling work, he won the title of Mr. Asia USA in 2007. One of the prizes was a one-year acting class, and upon completing the course, he began auditioning as much as he could. Sean said the recent success of films like “Crazy Rich Asians” is an encouraging sign, not only for his own career, but for the entertainment industry as a whole. “It’s cool to jump around in different shoes, and I think I’m most proud to maybe pave paths for people who might look mixed like me,” he added. “Now that that the opportunity is here, it’s strange that my ethnicity is working in my favor,” he said. With his parents settled in Oxnard, Sean lives in the L.A. area with his wife and three kids. He said one of the major challenges of accepting one of the greatest jobs in acting – a Star Wars role – is that he was forbidden to tell anyone about it. Sean said his animated counterpart is an accurate reflection of himself, offering a comfort level that made for an easy entry into the role. “In a lot of ways, I’m still the black sheep, so [it’s good] to have a character that has a mixed look, that people can relate to,” he said. “He works with some amazing characters as he goes on his mission to spy on the First Order, people like Po and Leia Organa. 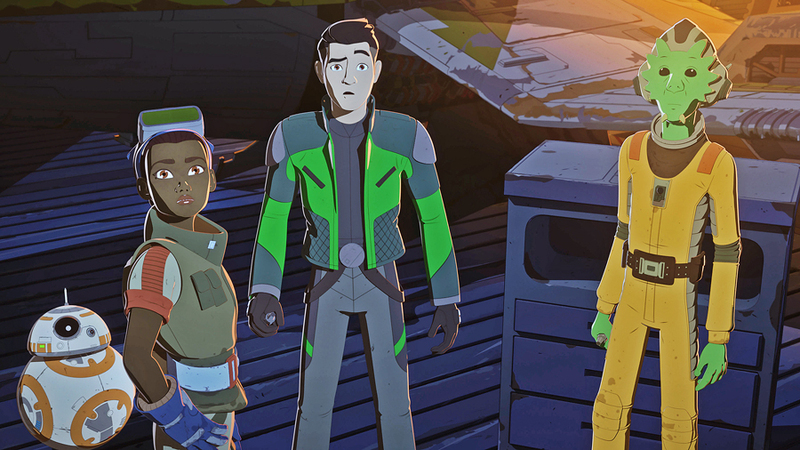 “Star Wars Resistance” debuts Sunday at 10 p.m. on the Disney Channel, with subsequent airings on Disney XD. It will also be available via DisneyNOW and Disney Channel On Demand.